Dynatrace detects the applications’ transactions from end-to-end and points out the execution of each service through our service flow. Dynatrace automatically pinpoints components that are causing issues with big data analytics of billions of dependencies within your application stack. Gain insights into the health of your ASP.NET apps running in the Azure Cloud or on AWS. As the first provider on the APM market Dynatrace supports ASP.NET Core and allows permanent ASP.NET Core performance optimization. Regardless of where it is hosted, Dynatrace can monitor any ASP.NET Core application and gives deep insights into the environment. 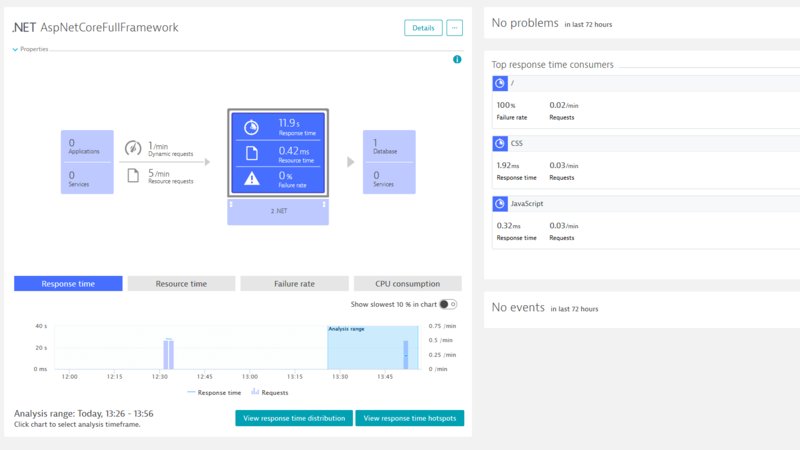 Important performance metrics like response time hotspots, resource time, or failure analysis are collected and shown within minutes after the deployment of Dynatrace. Dynatrace even captures every request so you can see what happens during the processing of that request including database or other external calls. Find more details on ASP.NET Core monitoring and receive tips on how to optimize its performance with Dynatrace. Start improving your ASP.NET Core performance with Dynatrace! ASP.NET Core is a free and open-source rewrite of the ASP.NET framework running on .NET Core and on Full Framework. ASP.NET Core is a free, open-source, and cross-platform rewrite of the ASP.NET framework. This includes even the pipeline and the hosting model. ASP.NET Core can run on .NET Core and on Full Framework. ASP.NET is lightweight and fast. Before the rewrite ASP.NET was tied to IIS. Now it is not anymore. Therefore ASP.NET can be self-hosted or it can be hosted by any web server very easily. ASP.NET is built on top of libuv. That is the same library that is used by Node.js. Try ASP.NET Core performance optimization now!